Interested in Becoming a Busker? 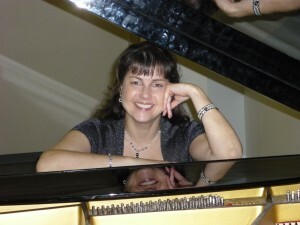 Interested in sharing your musical talents with the market community? 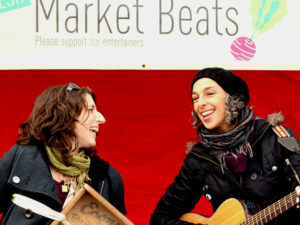 We book buskers at each of our markets each week all year long. 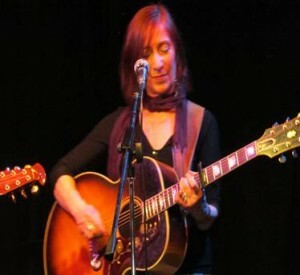 All music should be acoustic (we don’t have access to power at any of our market sites) and appropriate for an all ages event. Bookings must be done in advance through the market office. 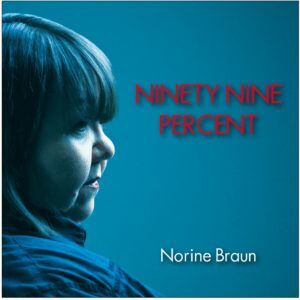 Please email for more information – be sure to include details about yourself / your band. 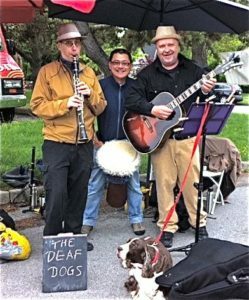 “The Deaf Dogs, a band of 3 musicians, storytellers and poets met while wandering around the Trout Lake Farmers Market several years back. 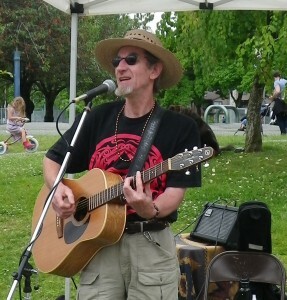 Jim Sands (on guitar), Michel Vles (wind instruments), and Wong Wing-Siu (on percussion) had seen each other around town at various music and storytelling events but the three fellows kept bumping into each other while they loitered around the Trout Lake Farmer’s Market looking for local organic food to fill their bellies. Inevitably, they started playing music together and telling each other larger and larger stories. Playing music together and busking at the farmer’s market seemed a natural progression.